The Republic of Sakha (Yakutia) is the largest subject of the Russian Federation. Territory of the Republic of Sakha (Yakutia) makes 3 103.2 thousand km2 (including Novosibirsk Islands), it occupies almost the total north-eastern part of the Asian continent going 2 000 km from north to south and 2 500 km from west to east. The Republic territory is washed by the Laptevs and East-Siberian seas. The major area is occupied by mountains, such as Verkhoyansky and Chersky ranges (the highest mountain of the latter, Pobeda, is 3 147 m high), and by some other plateaus and uplands (Sredne-Sibirskoye plateau in the west, Yanskoye, Oimyakonskoye and some other uplands in the east). In the north part there are Indigirka and Kolyma lowlands. The largest rivers are the Lena, Anabar. Olenyok, Yana, Indigirka and Kolyma. Yakutia features an extreme continental climate with the annual air temperature variation amplitude up to 100∞C (from +40∞C in summer to -60∞C in winter). The average air temperature in January is -43,2∞C, and that in July is +18,7∞C. In the Oimyakon community there is the Pole of Cold of the Northern Hemisphere where the lowest temperature of -71.2∞C was registered. The winter in Yakutia is long, cold, with a few of snow while the summer is short, mostly arid, with relatively high temperatures. The average population of the Republic of Sakha (Yakutia) in 2003 has made 948.2 thousand people. * The average population density is 0.3 people/km2. The number of economically active population is 514.6 thousand, or 54.2% (estimate). In 2003 the level of registered unemployment was 1.3%, the level of general unemployment being of 9.4%. In 2003 the portion of urban population was 64.5%, while that of rural population was 35.5%. The biggest cities of the Republic of Sakha (Yakutia) in 2003 (in thousand people) are: Yakutsk Ч 250.1; Neryungri Ч 89.6; Mirny -39.6. Within 5 years in republic positive rates of economic growth are marked: the gross regional product, volume of industrial production, agriculture. The main targets of economic development for the nearest years can be found in the republican task program named as Economic and social development of the Republic of Sakha (Yakutia) in the period up to 2007, as well as in the following main programs, namely: Provision of RS(Y) communities with gas, Development of gold mining industry and non-ferrous metals deposits in RS(Y), Development of diamond cutting industry in the RS(Y), Development of jewelry and gem cutting industries in the RS(Y), Development of coal mining in the RS(Y), Development of timber production complex in the RS(Y), Realization of exporting potential of the RS(Y). In 2003 the gross regional product of the Republic of Sakha (Yakutia) in current prices has made 130 406.6 million rubles which makes, in comparable price 102.7% as compared to the last yearТs GRP. The growth was mainly due to the industry, agriculture, construction, transportation and communications, retail trade. As to the GRP value per capita, the Republic of Sakha (Yakutia) in 1999-2003 was taking the 3rd Ч 4th place in the Russian Federation and the 1st place among the regions of the Far East Federal District. In industry which is the major branch of the Republic economics there are some 700 enterprises with various forms of ownership that employ 92.8 thousand of people. The main branches of the Republic of Sakha (Yakutia) are: non-ferrous metallurgy, power industry, fuel industry combining more than 90% of the total industrial production. The nearest years in the industry the following targets are determined: switching to a finer processing of raw materials produced, creation of new facilities on the bases of active use of modern technologies, research developments and implementation of all market mechanisms; diversification of the industrial structure with the purpose of increasing the portion of products featuring a high level of natural resources processing, transition from the raw material export to export of the final products and services. Fuel-energy complex. Availability of fuel and energy resources and a state support has made it possible to create in Yakutia a rather developed power base taking one of the leading places in the Far East of Russia. The Republic produces 34.4% of coal, 44.5% of natural gas, 20.7% of electric power in the Far East Federal District. Power industry. The portion of power industry in the total industrial production is 12.2%. The biggest power stations in the Republic include a Vilyuisk coordinated hydroelectric system which is the most powerful one in the Far East Region (two hydroelectric power stations with total capacity of 680 mW, the third stage of the system with capacity of 90 mW will be commissioned in 2004), Neryungry Power Station (570 mW), Yakutsk Power Station (260 mW). Accounting for available standby electric power sources, the integrated capacity of all power stations located on the territory of the Republic of Sakha (Yakutia) makes it possible to produce over 8 billion kW-hrs per year, the Republic own demand in electric power being less than 7 billion kW-hrs. Fuel industry. A portion of the fuel industry in the total industrial output is 10.9%. In the coal mining the output of coal produced in 2003 has made 10544 thousand tons (106.7% to a level of 2002). Yakutugol JSC, a holding company which is the main supplier of coal from the Republic to other RF regions and a big coal exporter to the countries of the Asian-Pacific Region plays the leading role in the local coal industry. In 2003 exported from the Republic were some 7 597.6 thousand tons of coal for the sum 7,3 billion roubles (72.1% of the total output), including 5 087.6 thousand tons delivered to the APR countries. In the oil industry the output of oil produced in 2003 has made 289.9 thousand tons, 30.9 thousand tons was exported. Under operation are Srednebotuobinskoye, Irelyakhskoye and Talakanskoye deposits. The main oil production refers to Lenaneftegaz JSC (over 77%). In the gas industry the amount of natural gas and gas condensate produced in 2003 was 1609.8 million m3 and 77.2 thousand tons, respectively. Under operation there are three deposits: Srednevilyuiskoye and Mastakhskoye gas condensate deposits as well as the Srednebotuobinskoye oil-gas condensate one. The major gas production falls at Yakutgazprom JSC (over 84%). A further development of the fuel-energy complex is connected with a further development of deposits of the South Yakutia coal field, development of small coal quarries, completion of reconstruction of the Process Plant of Yakutugol JSC and re-equipment of the Neryungrinsky quarry and Jebariki-Khaya coal mine, Kangalass coal quarry, development of Elginskoye deposit; with putting into extended operation of gas condensate deposits such as Chayandinskoye and Srednevilyuiskoye, as well as of the Talakanskoye and Srednebotuobinskoye oil-gas condensate deposits, which would allow not only for diminishing the RepublicТs dependence on fuel deliveries but for obtaining considerable profits from selling fuel and energy resources to other RF regions and to the APR countries. Non-ferrous metallurgy. Its contribution to the total industrial output is 68%. A share of the diamond production industry in the total industrial production of the Republic was over 60%. The major diamond production falls at ALROSA JSC. Diamonds are also produced by some smaller companies such as Alrosa-Nyurba JSC, Nijne-Lenskoye JSC, AlmazyAnabara Ltd. and KDM Olenyok Ltd. In 2003 the production amount was 1 764.6 mln. USD in prices adopted in the diamond production industry. In the diamond-cutting industry a production index has made 123.1% as compared to that of 2002 and its share in the total industrial production has been equal to 3.4%. Among the biggest companies working in this field are as follows: ALROSA JSC, Tuymaada-Diamond Ltd., State unitary enterprise of Komdragmet, EPL-Diamond Ltd. and Choron-Diamond Ltd. In 2003 the production amount of natural graded cut diamonds was 246.5 mln. USD, the total amount of sold products being 273.3 mln. USD. In the gold-mining industry the gold production has increased by 10.8% in 2003 making a share of 7.3%. in the total industrial production. The biggest gold producers are: Aldanzoloto JSC, Aldgold JSC, Zolotinka Ltd., cooperatives Zapadnaya and Seligdar, Nirungan Ltd., Neryungri-metallic Ltd., cooperatives Novaya and Drazhnik. The amount of gold produced in 2003 was 7.2 billion rubles in current prices. The total amount of gold sold beyond the Republic was 4.6 billion rubles, gold sale have being increased by 3%. In the jewelry industry in 2003 the production index has made 103.1% with the total price of articles produced of 558.8 million rubles, of that amount of jewelry sold beyond the Republic was 236.2 million rubles. The main producers-suppliers are: Zoloto Yakutii JSC, Sakhayuvelir JSC, Aldanzoloto JSC. In the period of 2004-2006 the main emphasis will be given to the following: development of the diamond production industry due to switching to underground production in the actual mines such as Aikhal, Mir, Udachnaya, in a standby explored deposit of the Komsomolskaya pipe, and due to a further development of the Nyurbinsky and Botuobinsky quarries; development of the diamond cutting industry due to its upgrading on the basis of terms of long-term and short-term leasing, crediting, organization of R&D programs for upgrading and development of jewelry and cutting technologies; organization of regular activity of the Diamond Exchange; creation in the RS(Y) of a specialized customs point; development of gold production due to development of a group of deposits of the Kuranakhsky and Nijne-Yakokitsky ore fields; realization of investment projects on development of Nezhdaninskoye and Kyuchyus gold deposits; implementation of a heap-leaching technology when involving into production of mediumЧ and low scale gold deposits of the Verkhne-lndigirsky and South Yakutia gold production provinces; organization of a stable production of tin and antimony accounting for economic efficiency and market opportunities; development of the jewelry industry due to creation of cutting and jewelry enterprises; re-equipment and upgrading of the existing facilities, implementation of modern technologies of gem-cutting; development of facing stone deposits such as Mariyka, Taloye, Ogonyor and Nadezhda. A share of the timber industry in the total industrial production has made 0.9%. The biggest producers are: Sakhales JSC, ALROSA-Lesprom, Aldanlesprom JSC and Mass Ltd. In 2003 sold beyond the Republic were 8.05 th. compact m3 of timber and 16.8 th. m3 of lumber. In structure of industrial production the industry of construction materials takes 0,9% that makes 927 million rubles. In 2003 produced were 223 th. tons of cement and 797.6 th. m3 of non-ore construction materials. Food industry. Its share in the total industrial production is 1.8%. The main trends in this industry are: production of meat-, milkЧ and fish products with various levels of processing, production of alcoholЧ and non-alcohol drinks. The biggest producers are: State unitary enterprise Yakutia, State unitary enterprise Yakutsky khle-bokombinat, Yakutsky gormolzavod JSC, Sakha-As Ltd. The output of production of an agriculture for 2003 has made 9219,4 million roubles in established prices or 101,9 % to a level of 2002, in a comparable estimation. The share of an agriculture in a total regional product has made 3,4%. Among regions of Far East Federal District on total amount of manufactures of agricultural production the Republic of Sakha (Yakujia) takes 1 place. The main targets in development of agriculture are: improvement of marketability and profitability of agricultural production, development of various forms of integration and cooperation between the existing enterprises, between communities and districts, between agricultural and industrial companies, organization of material and equipment procurement on the basis of leasing terms, development of traditional northern occupations, increasing of the amount of stocked products, creation of new jobs by introducing new types of production, creation of conditions for a natural reproduction of food species. The Republic of Sakha (Yakutia) extends for 2 000 km from north to south and for 2 500 km from west to east. The total length of roads in the Republic of Sakha (Yakutia) is 19.8 thousand km, including 2.1 th. km of federal highways and 17.7 th. km of regional roads. A share of highways of general use with improved pavement is 0.59 th. km (3%) while that of roads with hard surface is 7.36 th. km (37%). By auto transport in 2003 it is transported to 2653 th. tons of cargoes and 97291.5 th. person, the cargo turnover has made 234.8 mln. ton-km, a passenger turnover Ч 574,5 mln. passenger-km. Water transport. The route length of internal navigable waterways of general use in the Republic of Sakha (Yakutia) is over 16 th. km. The water transport of the Republic comprises six river ports (Yakutsk, Nijneyansk, Belaya Gora, Lensk, Olyokminsk, Khandyga), two sea ports (Tixi and Zelyony Mys). The main waterways of the Republic are the following rivers: Lena, Vilyui, Aldan, Kolyma, Indigirka and Yana. By internal water and sea transport it is transported to 2950.5 th. tons of cargoes, the cargo turnover has made 3394.5 mln. ton-km. By an internal sailing charter for 2003 it has been transported 96.5 th. passengers, the passenger turnover has made 14.7 mln. passenger-km. Railways. The route length of railways of general use in the Republic of Sakha (Yakutia) is 360 km. Under construction is a Berkakit-Tommot-Yakutsk railway which would provide reliable transport links in the North-East region of Russia and would decrease considerably expenses for goods delivery. For 2003 it is transported 11015,6 th. tons of cargoes, a cargo turnover 1191,3 mln. in ton-km, it is transported 124,8 th. passengers, the passenger turnover has made 217,8 mln. passenger-km. Airports. The airport network of the Republic of Sakha (Yakutia) consists of 33 airports, 2 of them being the airports of federal level (Yakutsk, Tixi). In 2003 the aviation companies have transported 666.8 th. passengers, 31.7 th. tons of cargo and mail. Oil and gas pipelines. The route length of the main gas pipeline in the Republic of Sakha (Yakutia) is 1 818 km. In 2003 pumped through the main pipelines have been over 1 600 million m3 of gas and 223.5 th. tons of oil products. In 2004 a transport strategy of the Republic of Sakha (Yakutia) that determines the main trends of the Republic transport complex development up to 2025 has been developed. development of a small and passenger aviation, upgrading of ice ships and a small size fleet. Discovered in Yakutia are more than 1 500 deposits of various mineral resources, including 150 kimberlitic pipes, around 600 gold-bearing-, 44 tin-bearingЧ and the same number of coal-bearing deposits, 34 oil-gas fields, 26 mica deposits, 7 iron ore ones, along with a number of antimony-, zeolite-, apatiteЧ and many other deposits. The Republic energy resources are also very considerable: the Republic accounts for 47% of explored resources of coal, 35% of natural gas and oil of the Eastern Siberia and Far East as well as for 22% of the total water resources of Russia. Nowadays, the Republic of Sakha (Yakutia) takes the leading positions in Russia providing, in particular, 100% of antimony, 98% of rough diamonds, 40% of tin, 15% of gold and 24% of cut diamonds. According to the existing estimates, the Republic concentrates the main explored and probable Russian resources of diamonds and antimony, 40% of tin, 20% of gold, 9% of exploredЧ and 15% of probable resources of tungsten, 10% of mine able reserves of phosphates, iron ores and significant reserves of hydrocarbons. Many explored but currently not operated deposits are known as large, unique deposits of a complex type. Diamonds. The total amount of explored resources of diamonds is capable to sustain the diamond production industry for 40 years. In accordance with a five yearsТ program of diamond production industry development in the Republic it is planned to construct and commission four underground mines (Udachny, Aikhal, Mir, Internatsionalny); in August 2003 a Nyurbinsky mining and processing enterprise was put into operation. Oil and gas. The predominant part of hydrocarbon resources is concentrated in such oil and gas-bearing provinces as Vilyuiskya, Nepsko-Botuobinskaya and Predpatomskaya. The largest reserves of natural gas are located in such deposits as Srednevilyuiskoe, Srednebotuobinskoye, Srednetyungskoye, Verkhnevilyuchanskoye and Chayandinskoye. All oil reserves that have been discovered by now are located within the Nepsko-Botuobinskaya oil-bearing province. Under a pilot production are being now the following deposits: Srednebotuobinskoye (with recoverable reserves of 66.1 mln. tons), Irelyakhskoye (with recoverable reserves of 10.2 mln. tons) Talakanskoye (with recoverable reserves of 123.8 mln. tons). The existing oil resources are capable to sustain the initial operation of the oil industry while those of natural gas are capable to sustain the gas production for about 40 years at the maximum production rate of 35 billion m3. Ч organization of works for production, transporting and processing of gas from the Srednevilyuiskoye gas condensate deposit. To improve reliability of gas supply and capacity of the existing pipelines, to produce liquefied gas and motor fuel for covering needs of Vilyui districts and its supply to consumers of the Central region of Yakutia, under construction is a third line of the Mastakh-Berge-Yakutsk main pipeline from the Srednevilyuiskoye gas condensate deposit that is financed from both the Federal budget and from the state budget of RS(Y). Completed is the construction of a LPG Plant in Yakutsk. Coal. As to geological resources of coal, the Republic of Sakha (Yakutia) takes the first place in the Russian Federation with more than 40% of the total Russian coal reserves. By now only 44 deposits are enlisted in the State Balance totaling 9.6 billion tons. A considerable part of the reserves represents high-quality coking coals: Neryungrinskoye and Elginskoye are the deposits for open mining with respective reserves of 307.3 and 2047.8 mln. tons; Denisovskoye and Chulmanskoye are the deposits for underground production with respective reserves of 28.8 and 758.3 mln. tons. As to the Elginskoye deposit, a study of coal quality is being carried out in conformity with international standards, as well as some survey work has been done along a Elga-Ulak railway and on the deposit itself. In January 2003 there was an open tender for a state holding of shares of the Denisovskoye JSC (coal quarry) representing 49% of the authorized capital stock. Seven companies incorporated in Moscow and Elista (Kalmykia) took part in the tender. A company from Moscow, SEAR MF JSC (related to Evrazholding) was the winner. Gold. The gold resources base is one of the largest in Russia (over 20% of the total Russian reserves). Gold is widely spread over the entire territory of Yakutia but the industrial gold-bearing capacity is concentrated in the Eastern and South Yakutia, mainly, in the basins of Indigirka, Yana and Aldan rivers. Conditional life of supplying gold producers with gold reserves is 67 years on the whole for the Republic, including over 200 years for ore gold and 34 years for placer gold. To increase gold production and improve the efficiency of using gold resources, a program of gold industry development and non-ferrous metals deposits development in the Republic of Sakha (Yakutia) has been worked out and being implemented now. Ч operation of the Tabornoye and Zaderzhninskoye ore gold deposits. In December 2003 the first starting complex of Nezhdaninskoye mining and processing enterprise was commissioned. Examination of the deposit total reserves is being now completed. Silver and polymetals. The Republic has large resources of silver and poly-metals. Being prepared are investment projects on development of large silver-complex ores deposits such as Sardana, Verkhneye Menkeche and Prognoz. Reserves of the deposits are prepared for industrial mining. In the nearest future, it is planned to create a mining enterprise for a pilot operation of Sardana and Prognoz deposits. Tin. As to tin reserves (about 50% of the Russian total) and production (about 40% of the Russian total) the Republic takes the first place in the Russian Federation. Small-scale exploration works are carried out only on the Churpunyinskoye deposit replenishing some 10% of mined reserves. Antimony. Explored and probable antimony reserves in the Republic make over 90% of the Russian total. A raw mineral base is represented by the large Sarylakhskoye and Sentachanskoye gold-antimony deposits as well as by the small Maltanskoye, Kimovskoye and Tanskoye gold-antimony deposits with low grade associated antimony. The reserves of Sarylakhskoye and Sentachanskoye deposits are estimated to be 210 th. tons of antimony. It is planned to develop a feasibility study to make a decision about a possible creation of a metallurgy plant for producing antimony as a final product, and to diversify production facilities of Sarylakh-Surma JSC. Niobium, rare earth metals. The Tomtorskoye deposit situated in the north-west part of Yakutia is a promising and large source of rare metals, including niobium and yttrium. Developed is for industrial production a large raw mineral base containing niobium and rare elements of the yttrium group that is capable to satisfy the proper Russian needs for a long term. 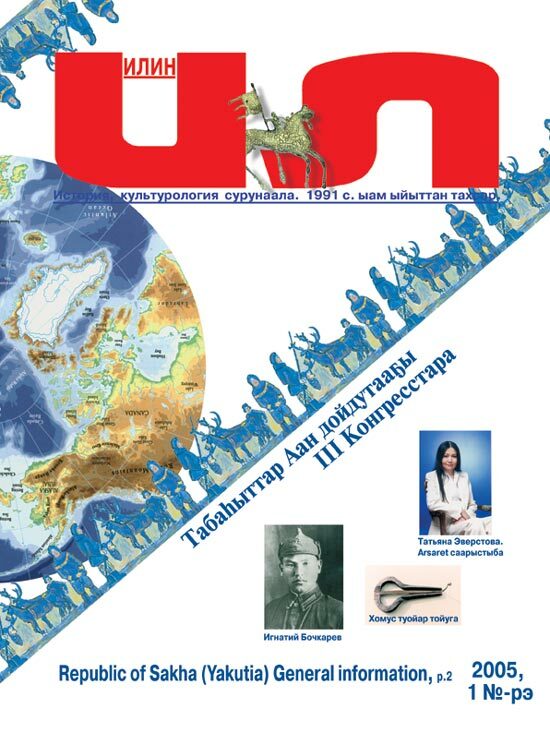 In 2004 it is planned to start pilot operation at the Tomtorskoye deposit. Titanium and iron ores. At present coming are to the end assessment survey works on the Torginskoye titanium deposit of the Murunsky ore massif in the South Yakutia. Imalykskoye). A long-term prospect of developing the iron ore deposits of the South Yakutia is due to a necessity of creating here a large coal-metallurgical base. Apatite etc. In future a great role in social-economic development of the Republic will be played by deposits of apatite in the South Yakutia (for example, Seligdarskoye deposit), by deposits of piezooptic minerals (Perekatnoye, Pyat Paltsev (Five Fingers), Tabornoye and others), by deposits of gems (Inagli, Sirenevy Kamen (Purple Stone), Mustakh etc. ), by those of construction materials, rock salt, mineral waters, zeolites and phlogopite. In 2003 the foreign trade turnover was 1 366.6 mln. USD making an increment of 19.7% as compared to 2002. The amount of export (1 271.5 mln. USD) has 7 times exceeded that of import (95.1 mln. USD). The greatest share in the range of export merchandise belongs to cut and rough diamonds, and to coal. The shares of merchandise exported to CIS countries and to the other ones were 2% and 98%, respectively. Among the main countries importing locally produced merchandise are: the UK (50.1% of the total figure), Belgium (11.1%), Japan (10.9%), Israel (9.7%), the USA (6.1%). In 2003, the main place in the range of merchandise imported by the Republic was taken by various equipment and mechanic devices (43%), trucks (17.6%), rubber and rubber products (13.6%). The main exporting countries are: the USA (37% of the total import figure), Sweden (24.3%), Japan (11.7%). Ч a unique tourist potential. In the economics structure the major investments in the fixed capital fall at the industry, construction, transport and communications, and housing and communal services. 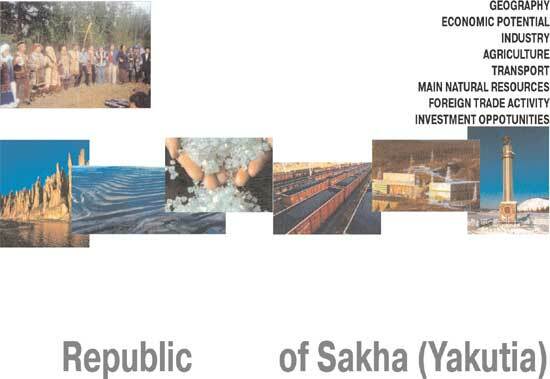 The Republic of Sakha (Yakutia) takes the second place on foreign investments in the Far East Federal District (after the Sakhalin region). The most appealing for investors are the diamond-cutting and gold-mining industries as well as the fuel and energy complex (oil-gas production, coal-mining and power industry). 1. Verkhne-Munskoye kimberlite field (ledge diamonds), Olenyok district. 2. Sardana deposit (poly-metals), Ust-Maisky district. 3. Derbeke deposit (placer gold), Tomponsky district. 4. Denisovskoye deposit (coal of D15, D11 and D19 categories), territory under authority of Neryungri municipal administration. 5. Verkhneye Menkeche deposit (silver, pol-metals), Tomponsky district. 6. Lunnoye deposit (ore gold, silver, uranium), Aldan district. 7. Tomtor deposit, Buranny site (rare earth elements), Olenyok district. 8. Malo-Tarynskoye ore field (ore gold), Oimyakonsky district. 9. Chayandinskoye oil-gas condensate deposit, Lensky district.